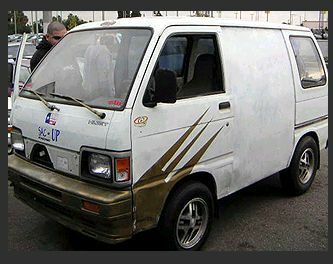 Awal cerita Modifikasi Hijet 88 (USA) dari sumber aslinya. Meet Wyatt. This 18-year-old rocker just moved to L.A., and his ride is not feeling the love. 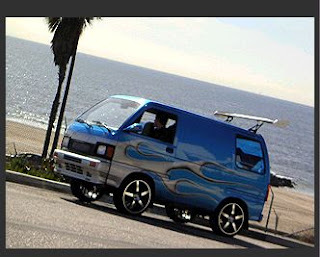 Wyatt rolls in a 1988 Daihatsu Hi-Jet and feels that his car is holding him back from landing a job and making a new start for himself in L.A. Less than a minivan, this "micro-van" is held together with hope and duct tape. Side doors consist of little more than sheet metal and rivets. But that's all about to change. Xzibit is about to pimp his ride. There are no smooth ways to answer these questions. X swoops in to take the car for an unparalleled makeover at West Coast Customs. These super-mechanics are used to tricking out Hummers and Ferraris. But there's a first time for everything as Ryan, Q, and the guys at West Coast plan to turn the Hi-Jet into a "Fly-Jet." The guys have grand plans for the Daihatsu. And while it's not everyday that you see $20,000 worth of parts and labor put into a $400 1988 Daihatsu, hey, this is Pimp My Ride. A custom paint job, sweet 17-inch chrome rims, a wrap-around couch and an entertainment system that offers three screens of viewing are only the beginning. After a few days it's time for the grand unveiling. Wyatt is beyond psyched. The car now has two MP3 players, a mini-fridge, a guitar amp, six-DVD changer, forward-facing camera, and a new battery system to keep both the car and its gadgets running smoothly. It's time for a joy ride. Wyatt's friends and fam barely recognize the car. Wyatt is ready to take on the world in his new Fly Jet, thanks to all the folks at Pimp My Ride. dicat biru metalik, hasil campuran, dinamakan "Hijet Blue"
di langit-langit bagian tengah, dipasang 3 lcd 15" untuk dvd player, dan masing-masing bisa play dvd yang berbeda-beda. lcd dihubungkan juga ke sebuah spycam yg dipasang dibelakang grill depan, jadi bisa lihat ada apa di depan . dipasang sign bergambar "No Smoking & Fasten your seatbelt" persis yang ada di airplane, alasannya karena nama mobilnya Hijet maka harus ada komponen yang berbau-bau jet/pesawat terbang.